Two days ago I had a meeting with the web designer from Elite Infotech, Archanna, and the Sysadmin from the hosting company, People Link, Suresh. It was an excellent meeting that I left excited and relieved. This meeting was set up so I could drill down into to technical questions I had about the website. Archanna and Suresh were great and had answers for all my questions. I also took this opportunity to introduce the recommendations I have been developing in my report – since they are the home team, I wanted to make sure they could get on board the kind of changes I was thinking about and I really didn’t want to seem like I was criticizing their work. Rather, I am working to devleop a long-term website strategy for FTG Nepal, which includes the way forward to improve quality and manage the cost of the site. After a week of being the sole expert, it was wonderful to be with people who “talk my language” and to have a fast-paced technical discussion. 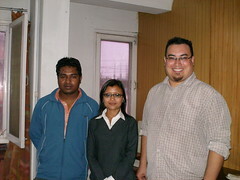 Both Archanna and Suresh are talented, skilled IT professionals; it was a real pleasure to work with them. If fact, it was very interesting to hear that web developers face the same sorts of challenges around the world; when I broached the topic of potential changes, which include web standards validation, semantically-driven design, consolidation of stylesheets and CSS based layouts, both Archanna and Suresh were in agreement and told me that they agreed. In fact, these things were not in place because of a very tight deadline. This is apparently the universal story of web design! It was very enlightening to encounter the same sorts of challenges here as I regularly do in Canada. I have already had some great follow up from the meeting and I’ll be able to wrap up my report very soon, as I have all the information I need now. More importantly, I have a sense that the direction of my recommendations are in tune with the local partners of FTG Nepal. I already am starting to have a sense of satisfaction and accomplishment about my work here. I still have lots to do, and not much time to do it in, but it’s great to feel like I’m off to a decent start. Namaste Sean!! Wow Nice blog !! Wonderful post!! It was so nice to meet you. We can guess that you are very helpful person. Thank you so much for contributing FTG Nepal website.